In the first gameweek of December, the average points scored accumulated to just 49 across the board. 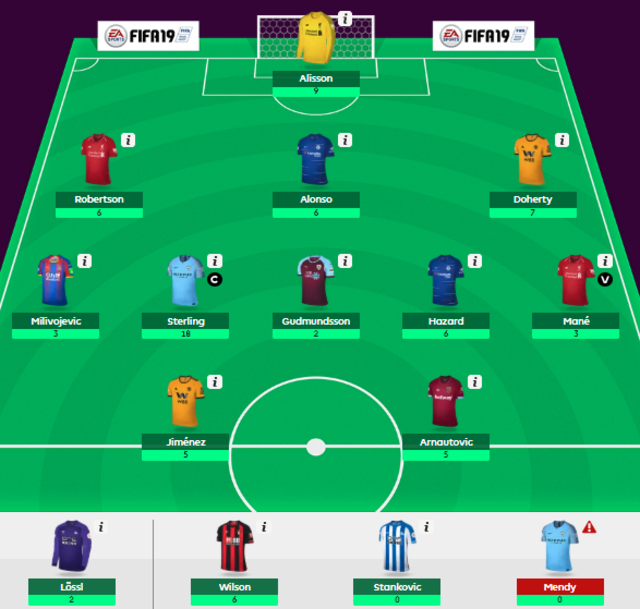 In the first gameweek of December, the average points scored accumulated to just 49 across the board. There were 30 goals scored, while just four teams kept clean sheets in the Premier League, leaving points hard to come by. However, Пфт Ч Чоц did not feel the effects, moving into top spot of the AFC Bournemouth fan league after a gameweek score of 70 points. At the back, Alisson bagged nine points for his role in the Merseyside derby, while Matt Doherty came up trumps in Friday’s game with a goal against Cardiff. Up the other end of the pitch Raul Jimenez and Marko Arnautovic both bagged an assist each, while it could have been even better for the user should Callum Wilson have been selected as opposed to on his bench. Nevertheless, just one point behind in the overall standings is Ahmed Ibra, who scored 54 points this week. Marcos Alonso, Andrew Robertson and Aaron Wan-Bissaka all kept clean sheets in defence, while Arnautovic proved a popular selection up front, with Ahmed opting to include him too. Nevertheless, despite being ranked lower in the league, it was Gary Menday who scored higher than any other AFC Bournemouth fan this week with an incredible score of 100. Virgil van Dijk got the pick of the points in defence for Gary, after a clean sheet and a last-minute assist saw him total 12. Up top, it was a triple captain choice on Pierre-Emerick Aubameyang that saw a total of 48 points added to the team, with the Gambian netting twice in the north London derby against Tottenham Hotspur. Elsewhere, Alonso, Wilson and Trent Alexander-Arnold all scored well to see a healthy score for Gary.